The island of Burano in Italy: lace, colourful houses and good risotto. Connections Burano with water buses (Vaporetto). Burano (in the local language Buran) has preserved the charm and character of a fishing village until today. Burano is only 0.2 km² in size, but has almost 3,000 inhabitants. No island in the lagoon of Venice has a higher population density. 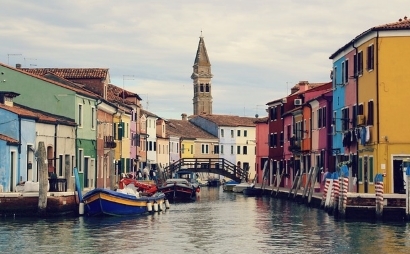 Burano is small and approximately circular. Every point of the island can be reached by foot in about 10 minutes from the water bus landing stage. There are no cars or motorbikes on Burano. However, the islanders have connected Burano with the neighbouring island of Mazzorbo with a bridge. Mazzorbo is about the same size, but very sparsely populated. Here the inhabitants of Burano find peace and green areas. Also on Mazzorbo there are no cars, but at least bicycles. This guided boat trip to the three islands Murano, Torcello and Burano is almost unbelievably inexpensive for Venice. The guided trip is especially suitable for tourists who have little time and still want to see several islands. On the way in the boat you are informed over loudspeakers in several languages (also English) about the islands and the lagoon. The islands you visit alone without a guide. The boat ticket is already included in the price of 20 Euro. For this price, the trip is a real bargain for the expensive city of Venice. The tour starts near St. Mark's Square. Lace is a product made of yarn and fabric that is traditionally handmade. The products can be, for example, scarves, tablecloths or garments. Burano has been world famous for lace for a long time. In spite of tourism, the craftsmanship on the island of Burano is unfortunately less and less practiced. Many of the lace offered in the shops are not handicrafts, but imports from Asia. These imported products are machine-made in the traditional Burano lace style. However, the craft of lace is unfortunately becoming extinct in Venice. There are only a few people left who are active in the protracted production of lace. Almost all of them are older ladies, there is a lack of offspring. Some of the ladies come daily to the museum, which is also a school for the art of lace making. These women work publicly in the museum, you can watch them doing their craft. The manual work is extremely complex. It takes many days, mostly even months, to make only one piece of cloth. Accordingly, genuine lace from Burano have prices of many thousands of euros. Often the laces are garments like dresses for women, scarves or blankets. 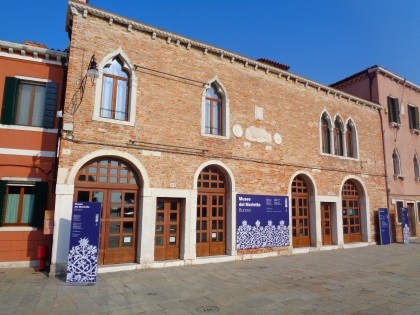 Opening hours Museum Burano: In the season from 10 am to 6 pm (April to October), in winter one hour less (10 am to 5 pm). Monday is closed all year round. The lace museum is also closed on some important holidays such as Christmas, New Year or 1st May. Museum of Lace Burano entrance fee: adults pay 5 euros. Backpacks and bags must be locked in a locker (free of charge). There is a toilet in the museum, but you can only use it if you have paid the entrance fee. Even more famous is the tower of the church Chiesa di San Martino Burano. 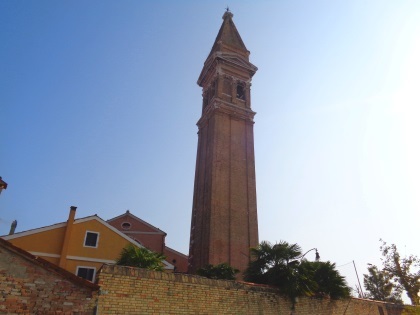 The church tower (Campanile) is the landmark of the island of Burano. It is, similar to the famous tower of Pisa, leaning. The island is said to have the best risotto all of Italy, some even say the best risotto in the world. The freshly caught fish and seafood from Burano also taste excellent in many island restaurants. The prices in the gastronomy are somewhat lower than in Venice. 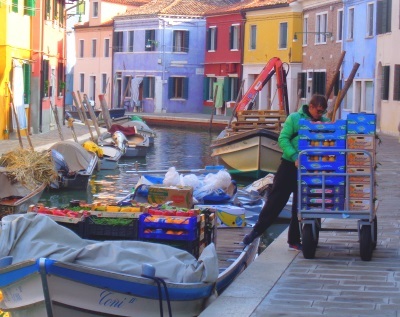 There are many shops in Burano that offer their goods to tourists. Many of them, of course, offer the famous lace. 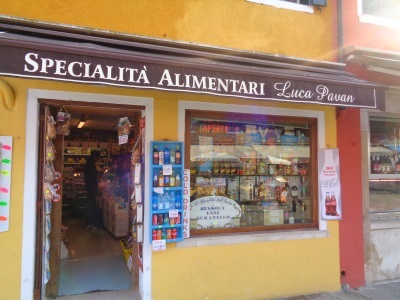 There are also at least two small supermarkets on Burano. Here you can buy drinks on a hot summer day at affordable prices. There is also a public toilet (price 1,50 Euro) near the museum and church of the island. The composer Baldassare Galuppi lived on the island of Burano for a long time in the 18th century. The most important means of transport on Burano, apart from the ships, is the sack truck. Especially many drinks have to be brought from the ships to the supermarkets and restaurants. From Venice (jetty Fondamente Nove in the north of the old town island) only the water bus line 12 runs on a fast way to Burano. The vaporetti stop on the way on the islands Murano (only stop Faro), Torcello and Mazzorbo. Mazzorbo is the island mentioned above, connected to Burano by a bridge. The total travel time from Venezia to Burano is about 42 minutes. During the season the ferries leave every 20 to 30 minutes during the day. You can find more information about ferries to Burano on this page. For many tourists who do not speak Italian, it is not easy to buy tickets for the water buses (vaporetti) in Venice. But you can also buy the tickets in advance on the Internet. Operating the ticket machines in Venice is complicated for many foreigners. If you find an advance booking office, there are often language problems. Moreover, the queues at the advance booking offices and vending machines are often very long. On this webpage you can buy the tickets (also the tickets for 48 hours and 72 hours). These tickets are also valid for the waterbuses to and from Burano. Further water buses connect Burano with Punta Sabbioni and Treporti on the mainland (also line 12, but only once per hour). But these places are far away from Venice. Interesting are the connections for tourists who spend their holidays for example in Lido di Jesolo or surroundings. Travel time to Treporti about 15 minutes, to Punta Sabbioni about half an hour. Some vaporetti also only connect the island of Burano with its neighbour Torcello (vaporetto lines 9 and 12). In addition, there is a night line between different islands, Venice and Burano. At night there are also direct ferries to Lido Island. There are no direct connections from Burano to the islands of Lido (except at night) and Sant Erasmo by water bus. A bridge connects the islands of Burano and Mazzorbo. 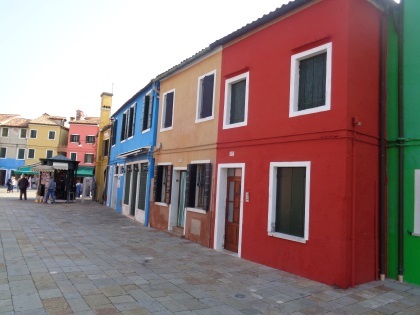 In Burano we have counted at least 15 restaurants, with snacks places and fast food. 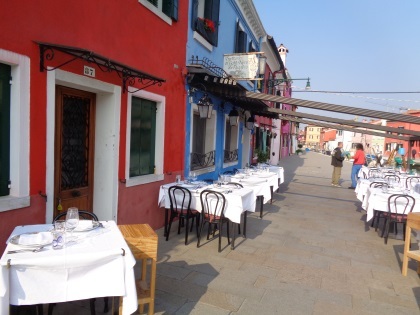 Many visitors come to Burano as part of a day trip and have lunch in one of the taverns. The prices are somewhat cheaper than in Venice, but a bit higher than in most regions of Britain or the USA. In the following some recommendations from different categories. Probably the best and most famous restaurant on Burano is the "Al Gato Nero" (The Black Cat). It is a restaurant of the luxury class, with appropriate quality and prices, which received many awards. Among the great appetizers at Gato Nero are, for example, the fish risotto with gobies (small fish). A typical Italian restaurant with average prices in Burano is the "Al Vecio Pipa" (The Old Pipe). The appetizers on the menu include scallops, salmon and ham with melon. Our Lasagne al Forno and the Cotoletta alla milanese (chicken schnitzel) tasted good. A visit to a pizzeria or a fast food restaurant is of course much cheaper. We really liked the "Pizza Take Away Devil" on the island of Burano. The good pizza Diavola with tomatoes, mozzarella and salami costs only 7 Euro (in October 2017). There is also fast food like hot dogs, hamburgers and much more here. We recommend in Devil Burano the large pizza pieces to take-away for 3 to 3.50 euros, especially the delicious vegetable pizza. Another fast food restaurant with the name "Fritto Misto" is directly opposite the jetty of the waterbuses just outside the centre of Burano. Ideal if you have to wait for the ferry. There is pizza, spaghetti, fish and much more. On big signs, cheap menus with drinks are offered, example: Fried fish with chips and a drink of your choice for 12 euros, cheap for Venice.